There’s a line that has haunted me forever, and I’m still trying to figure out why. It’s from Pauline Kael’s review of Jim Jarmusch’s Stranger than Paradise: “The desolation is a gag.” Since that’s all I’ve retained of the article, it remains an enigma: what the hell does she mean? Does she like the movie? Or is the existential trauma that it evokes, the cynical smirk or offhanded shrug that masks an infinite void, simply too much to bear? When the characters all buy cheap sunglasses in Florida (because that’s what you do when you’re in Florida), are they masking themselves from sentiment, from commentary, a kind of reverse-Stanislavskian gesture of anti-melodrama that crosses the boundaries of good taste? Is Jarmusch issuing an elaborate con or a warning? Do these questions, hurled unanswered into that same void, necessitate good art? 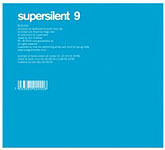 I have similar reactions to Supersilent’s 9, the album I thought I would never review, figuring the band would implode or my “career” as a music critic would, either of which was a viable option after the earth-shattering heights of 2007’s 8 (which has worked its way up from year-defining to decade-defining for me, barring a holiday Talk Talk reunion). Though implode they kind of did with the departure of drummer Jarle Vespestad; while I’m not going to stand with my hands on my hips and insist we call this new phenomenon by a different name, it is easily the biggest shift of their career. The common characterization of Supersilent as a single entity, which sees no single member as more important than the rest, also means that the removal of one piece could mean a complete upheaval. Which I guess is what you would call the band’s current incarnation: Arve Henriksen, Helge Sten, and Ståle Storløkken all jump on Hammond organ. Still, if the rather banal explanation for why 9 doesn’t live up to the standards of 8 (or really any of their previous records) lies in the fact that this really isn’t the same band, we can still pontificate on where they’re heading. 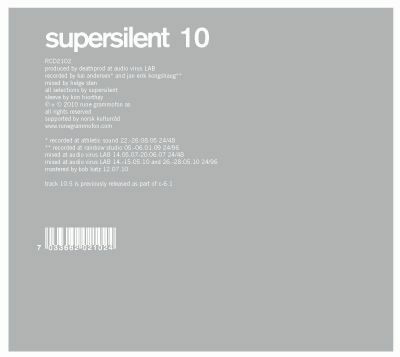 Supersilent have always flirted with anonymity—the titleless, monochromatic artwork, the electroacoustic free-for-all, everything about their sound that often gets labelled “monolithic”—but the now-trio (all wearing identical sunglasses, as it were) seem poised on the edge of self-obliteration. 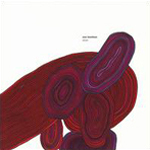 Whether it was that previous albums had merely pointed to the suggestion of non-expression as imminent (a negative form of the shamanistic spirit of free jazz), or that they found some form of a muted humanity within—certainly Henriksen’s voice and trumpet, if we have to isolate an element, often played that role—there was always a struggle. 9 is darker, more sinister, and to its credit probably more harrowing in its suggestiveness…but is still somewhat anti-climactic. It’s not that the album isn’t interesting. 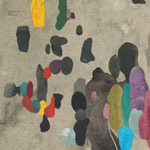 The band’s intuitive responses to each other ensure that, at the very least, 9 doesn’t become the indescript ambient record that it sometimes superficially evokes.  But even with the rumbles of “9.1” (it goes without saying the trio don’t respect the integrity of the Hammond), the album is unbelievably insular; the brief crescendo around the ten-minute mark is a fake-out. “9.2” is better and closer to what we’ve come to expect. 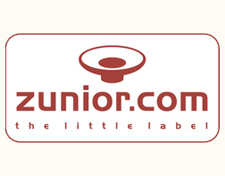 The beginning occupies the same negative space as Sunn O))) to brilliant effect, and while its pointillist middle (the missed rhythm section is more glaring here than anywhere) strays somewhere into Ummagumma (1969) land, it comes together again at the end in a way that suggests the band is actually resisting their own immense gravitational pull. But then the album submerges and never comes back up. While “9.4” forces close attention in a way that I think is beneficial, it still feels less like “deep listening” and more like strained listening. In an era of music where distance is almost always a thinly veiled appeal to nostalgia, Supersilent evoke genuine, futuristic isolation. But when the post-apocalyptic wasteland is already there, when doom is immanent (rather than imminent), 9 risks becoming like a dystopian equivalent of Music for Airports (1977), a cocoon for people without hope. And this was the problem I had with Stranger than Paradise. Not that any work of art has to generate false hope, but that this kind of overly aesthetic aesthetic—Bresson without the transcendence, Godard without the critique—loses the inherent complexities and contradictions that allow for struggle…and ultimately change. Worse yet, without a direct line to lived emotions and experience, it becomes an exercise (which is why all those dystopian science-fiction writers were able to churn out so many novels). It may be a gag, it may not, but 9 shows Supersilent a little too lost in the desolation.